Simon Says Shake it Up! This week the challenge is Shake it Up! For this challenge we would like to see some shaker style creations, you can shake some ink sprays and give your projects a spritz or use an action wobble to make something shake! Whatever you decide to shake we will be looking forward to seeing it! We are showcasing WE R MEMORY KEEPERS PRODUCTS this week. You don’t have to use them to join in with the challenge, but if you have them we would love to see them used! 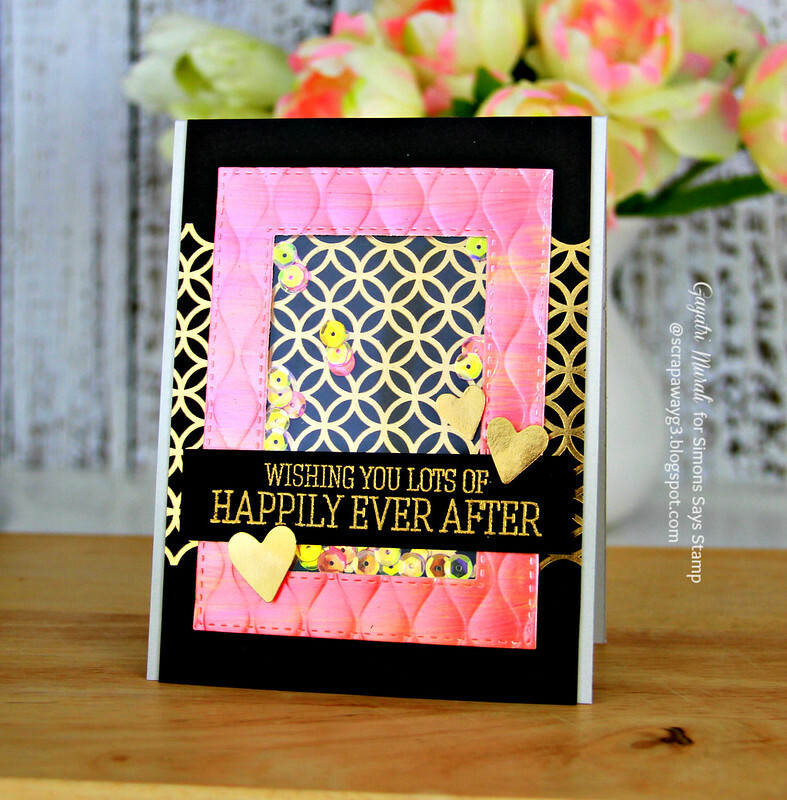 As you can see I have used We R Memory Keepers’s Next Level embossing folder on my card here. The frame is made by frist applying Cantaloupe and Flamingo Liquid Pearls on white cardstock. When dry I used two Simon Says Stamp Stitched Rectangle die to die cut a thick frame. Then I ran this frame through cuttlebug using Wave Next Level embossing folder. I adhered acetate sheet on the back of the frame. On a fog card base, I adhered the pattern paper from My Mind’s Eye Fancy That collection. These papers came in Simon Says Stamp May 2015 card kit. I love the intricate gold foiled design against the black. Very classic! I added some iridescent sequins from Pretty Pink Posh on the card front. The sequins I used are Ballerina Sunshine Glow and Strawberry Burst iridescent sequins. Then adhered the frame on the centre of the card front using foam adhesives to make a shaker box. I really love how elegant the frame is on the card front. The sentiment is from Congratulations stamp set also from Simon Says Stamp. This set came with Simon Says Stamp May 2015 card kit and is also available to buy on its own. I gold embossed the sentiment on black cardstock strip and adhered the strip over the frame using foam adhesives. Finally added some gold foil heat sticker from My Mind’s Eye Fancy That collection. I absolutely love the colours and contrast on this card. Classic and elegant at the same time. Beautiful glimmer all the way around, Gayatri! Those embossing folders are amazing, aren't they! Oh, this is gorgeous, Gayatri! A gorgeous card Gayatri, stunning papers and a beautiful element frame with super sequins and beautiful sentiment!! Beautiful shaker card!! Love it!! Gayatri, your card is WOW!!!!! The metallic color on the Next Level embossed frame is just WOW! This is a next lever shaker card for sure 🙂 THANK YOU for the inspiration! 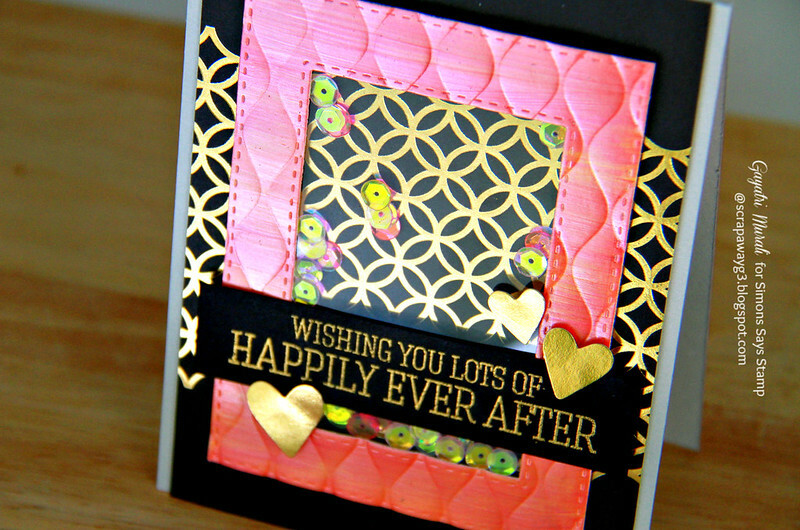 Just stunning card, Gayatri I Love the shimmer element from coloring with the liquid pearls! This is pretty amazing and I love the idea of cutting out a 3d embossed frame! This is just beautiful – love the gold and black – so elegant. Wow G! What a stunning card! Love the design of this!! So pretty!